MAY 5— Competing in his final multi event competition for Bethune-Cookman, Sr. Keron Stoute’s dream of winning the 2014 MEAC Outdoor Championships Decathlon crown was derailed by a hamstring injury. With three victories in five events Stoute amassed his best Day I total ever with 3834 points for the Wildcats during the championships in Greensboro, North Carolina, towards his goal of breaking the conference record of 6652 points and the 6609 BVI standard. He started Day II in the 110m Hurdles where he first felt a twinge in his hamstring. By time he cleared the Pole Vault with a personal best leap, he had affected it to the point to where it killed his 1500m run after leading his teammate by 108 points heading into that final event. 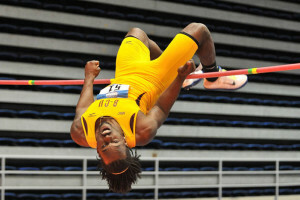 With 6151 points after nine events Stoute needed a minimum 458 score to break the BVI national record and 501 for the MEAC record. He limped home in last place in the 1500m in 6 minutes 26.22 seconds to merely pick up 167 points and finished second behind his teammate with 6318 points—291 off the BVI mark he aimed for. Stoute said his hamstring was a bit sore after the first day. He made changes to his approach in the Pole Vault and was more aggressive than in the past. 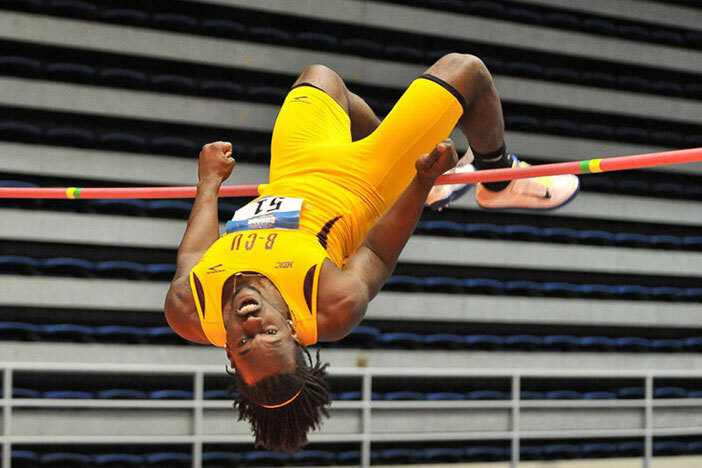 Stoute said in his Bethune-Cookman tenure, he has seen improvements in some areas he had not been strong in before and his High Jumping—where he placed fifth in the open division with a leap of 6’7”—took a backseat to his other events. He said his jumping stayed relevant and things evened out and he has seen improvements since joining the Wildcats program. Stoute’s 12 points contribution helped Bethune-Cookman to amass 132 points for its first MEAC Championships title in program history.